Ah, Instagram abounds with diabetics who perform superhuman feats of athleticism while battling their blood sugar levels at the same time. Not me. I’m here as your bog-standard ordinary gel whose only prize ever will be persistence. Did you note I got a massive disclaimer in there before going on to write about my latest race?! I like to make sure I’ve lowered the audience’s expectations before I start. Anyhoos, for those of you still reading, here it is. On Sunday, I ran another 10k in preparation for the BIG ONE (the half-marathon) next month. Conditions were much more promising than the last time. Back in June, Scotland experienced an unprecedented spell of warm weather. Plus, that course was hilly. And I woke up that morning with a blood glucose reading of 13.1. In theory, the Paisley 10k should have heralded a vast improvement. I’ve been running for longer, the back-to-usual Scottish summer conditions (dreich, grey and cool) were present, and the course is flatter. Bah, humbug dear readers. I added three minutes to my previous time. Not only that, the online system was cruel enough to remember I took part in the Paisley 10k ten years ago when I achieved my personal best. There it was, my 2008 time taunting me with its nine minutes faster brilliance. 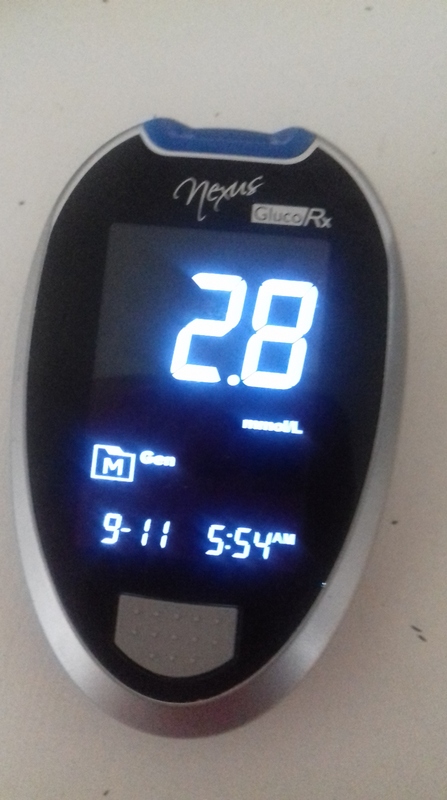 For those who want the numbers, I awoke on Sunday morning with a blood sugar of 8.5 (I’d knocked one unit off my basal rate the night before). Half an hour before the race, I was 8.1. I ate half a Hike bar before starting (10-15g carbs) and I finished the race at 11.1, possibly because I put on a sprint finish. Nothing like pretending your race pace is much faster than it really is. I didn’t take insulin afterwards, ate the second half of the Hike bar and went off for a session in the sauna. An hour later, my blood sugar level was 4.9. A massive portion of battered fish and mushy peas later (I know, NOT low-carb), further low blood sugars and indigestion kicked in*… 3.3 one hour after the meal, 5.8 two and half hours later. Lessons to take—eat more. Try something other than a Hike bar. Drop the daytime basal injection rate. Keep practising. Keep experimenting. Expect fluctuations and weirdness. Mass running events are special though. I’d recommend everyone takes part in at least one if they are able to—and these days there are loads of 5ks and even 3ks you can do. You see all shapes, sizes and abilities (and the two former don’t predict the latter), the crowds cheer you like a champ and even a slowcoach like me will overtake enough people to feel gratified**. The runners’ high exists. Now, time to take off my medal. It is two days later after all. Avocado, mushrooms, bacon and salad – plant-based. And now for something completely different… Last week, headline news suggested low-carb diets were dangerous—more likely to lead to an earlier death. **One of whom wore a tee shirt saying Vegan Runners. Just sayin’. So, you get to take all sorts of measurements and I need to answer lots of questions about what I eat? Sign me up! Reader, I adore a study and even more so when it relates to lifestyle. I started work at Glasgow University in April and spotted a poster looking for participants in a low-carb study. While certain aspects of the low-carbohydrate diet have been well researched, such as weight loss, there has been little focus on testing how this way of eating affects micronutrient levels in the body. The Glasgow Uni study, Nutritional and Cardiovascular Risk Factors associated with Long-Term Adherence to Low-Carbohydrate/Gluten-Avoidance Diets, funded by the Faculty of Medicine, Prince of Songkla University, Thailand, concentrates on this. What is the purpose of the study? Low carbohydrate diets (LCD) such as the Atkins Diet have become common dietary approaches for weight management, and aiming to avoid starchy foods such as bread, cereals, pasta, rice and potatoes which are major dietary sources of B-vitamins, magnesium, and fibre. The researcher is investigating the contribution of starchy / sweet foods in body composition, micronutrient status and cardiovascular risk factors. To do this, they seek people who either exclude or include these foods in their diet. I’m not one hundred percent low-carb compliant. Who is? But when I filled in the forms for the study, I realised that I follow a low-carb diet much more closely than I thought. How often do I eat potatoes, rice and pasta, the survey wanted to know—the answer, never or less than once a month for rice and pasta and about twice a month for potatoes. I eat bread more often (LOVE bread), and ditto chocolate, but I don’t bother with most of the other high-carb foods listed in the questionnaire. The outline of the survey had said they’d do urine testing. I assumed that meant a sample in one of those little tubes. Not so! The doctor sent me off with two large flasks (pictured) and asked me to collect all my pee over a 24-hour period. TBH, I wasn’t sure the two flasks would be enough. We diabetics tend to wee more than ordinary folks, anyway. When you add in my daily diet coke, water and peppermint tea intake, a lot of fluid swishes around inside me. And what goes in must come out! The survey will be followed up in six months’ time, then another six months after that and so on until two years are up.